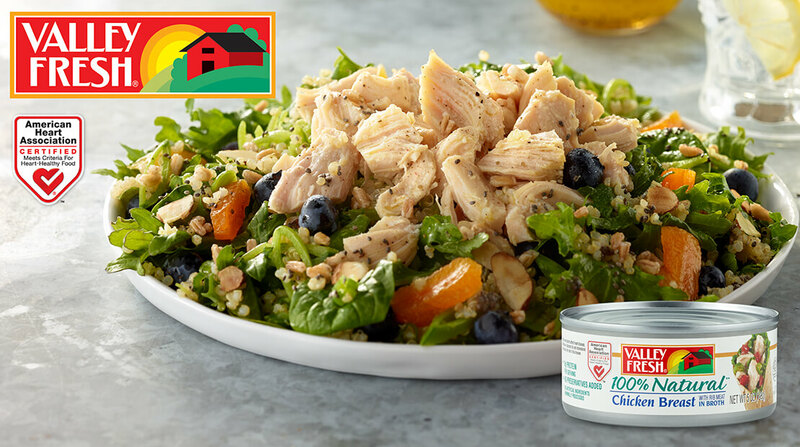 Hormel Foods (NYSE: HRL) announced today that the American Heart Association has certified two of the company’s VALLEY FRESH® chicken breast products with the Heart-Check mark to make it easier for consumers to identify heart-healthy foods. The Heart-Check Food Certification Program is designed to help consumers make informed choices about the food they purchase. The easy to identify mark means the food has been certified to meet Heart-Check nutrition requirements that limit saturated fat, trans fat, sodium and added sugars, and promote consumption of beneficial nutrients. All VALLEY FRESH® products are made with simple ingredients and contain no MSG, gluten, preservatives or artificial ingredients. According to research from the American Heart Association, 75 percent of consumers report that they are familiar with the Heart-Check symbol. Additionally, 75 percent of consumers say they are more likely to purchase foods that feature the Heart-Check mark, regardless of age or numbers of kids in their household. While all VALLEY FRESH® products are 100 percent natural and include no preservatives or artificial flavors, the brand’s 5 and 10 oz. 100% Natural Chicken Breast and 10 oz. 100% Natural White & Dark Chicken products include the Heart-Check mark on the label. The American Heart Association established the Heart-Check mark in 1995 to give consumers an easy, reliable system for identifying heart-healthy foods as a first step in building a sensible eating plan. Products that display the Heart-Check mark have been certified by the American Heart Association to meet criteria for heart-healthy foods. To learn more about the Heart-Check mark, to see a complete list of certified products and participating companies, and to learn more about the nutritional criteria, visit heartcheck.org.